Homelessness, and its visibility, is back in the news in Toronto. Concerns about the scourge of panhandling have once again surfaced in local media with city councillors regularly weighing in on the ‘problem’. With little evidence that there is a dramatic increase in the numbers of people sleeping in parks or ‘aggressively’ panhandling on sidewalks, calls are once again being made for a law and order response to address this highly visible manifestation of urban poverty; to crack down on homelessness with tougher laws and stricter enforcement. All of this raises important questions about how we respond to homelessness in Canada. What does it say about Canadians when popular thought suggests that the appropriate way to address the problem of homelessness is through law enforcement? Is the use of police in dealing with people who are homeless as much a part of the Canadian response to homelessness as is the provision of shelter beds, soup kitchens and street outreach? And perhaps most importantly, what is the impact of a law and order approach to homelessness on the lives of people who experience such extreme poverty? This report sets out to document the criminalization of homelessness in Canada by exploring the relationship between homeless persons – in particular, street youth - and law enforcement officials (both the police and private security). 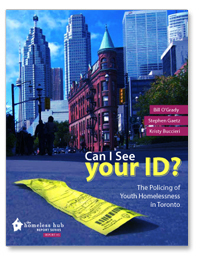 Drawing from over 240 interviews with street youth in Toronto in 2009, as well as a review of official statistics on Ontario Safe Streets Act tickets in Toronto over the past 11 years, we explore the ways in which homelessness has been criminalized through a law and order agenda. Effective policy should be informed by research, not developed as a response to moral panics. Our research raises serious questions about the use of law enforcement as a strategy to address the visibility of homelessness in Canada.